A couple of days ago I posted about a mini renovation I was wanting to do. 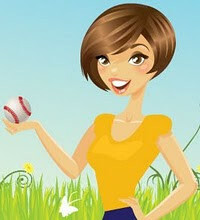 I recently found a new blog courtesy of the Queen B. Laura has some awesome ideas on how to keep you organized so you don't lose your mind. I completed my very own back pack station. Which is in my kitchen, hence the mini redo. I know, I would have rather had the counter tops redone, put in new flooring, and installed a farmhouse sink. But the budget wouldn't allow it. So here is what I did with my budget. 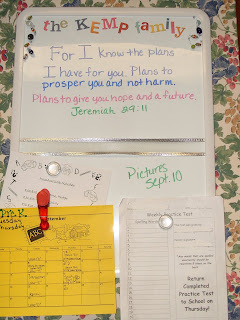 The dry erase board hangs on the wall above the bookcase and back packs. I added our name, the bead detail and ribbon in the middle for a little touch of whimsy. I found the hooks for the back packs at Home Depot which actually match the hinges on my kitchen cabinets. The bookcase and baskets all came from Target. The basket on top holds all of Hubs stuff...wallet, keys, cell phone. It is one of my new favorite things. It is carved out of tree knot and then sanded and finished. I love it. OK now it's your turn to be inspired. What a great idea! And I love whiteboards! I have to thank you sooo much for the beautiful tile from your giveaway! It arrived yesterday and I just love it! Thank you, thank you. I love that idea! 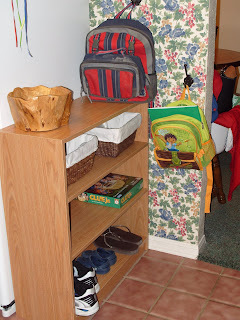 I'm inspired to do something similar, but maybe in my gargage for the backpacks and shoes. I love Org Junkie and Queen B! Your back pack station looks great! Very cool, it looks very functional! Thanks for stopping by my site, I really appreciate it.